One of the most beautiful things up here in the winter are the ice sculptures formed on the sides of the mountain. The small trickles of water coming out of the rock freeze in cold weather and make these amazing sights. In contrast to the ice are the pools of water in Cedar Run Creek, which almost appear green during the cool weather. The ice its self has almost a blue cast to it. Some ice depending on where the water seeps out will have other colors such as brown or reddish brown. 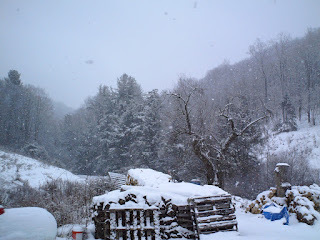 These pictures where taken behind the little log cabin along the road about 3 miles South of Leetonia on Leetonia Rd. Just thought you might all enjoy seeing them. As pretty as the ice and snow can be, I am about ready for some warmer weather. Tonight will get down to 8 degrees so won't be too Springlike in the morning. For those of you marking your calenders for some March events, the Maple Sugar Festival will be March 23rd and 24th. Set your sweet tooth for some goodness. Mountain girl, Paula, logging out. Today I took a walk down past Cedar Crest Camp and to the turn past the first narrow stretch about two and a half miles from my house. The temperature was around 25 degrees and a little breeze made it nippy at times. 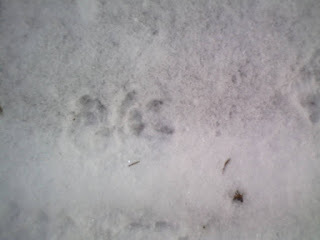 Saw my first opossum tracks of the year just in front of Mick's old place. 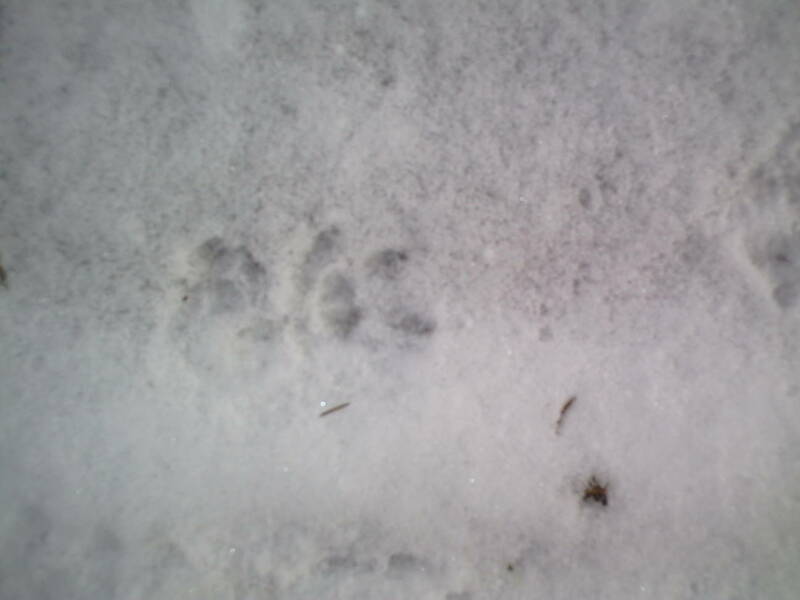 Also saw a few fox tracks along the way, but otherwise not much to talk about in the way of animals. 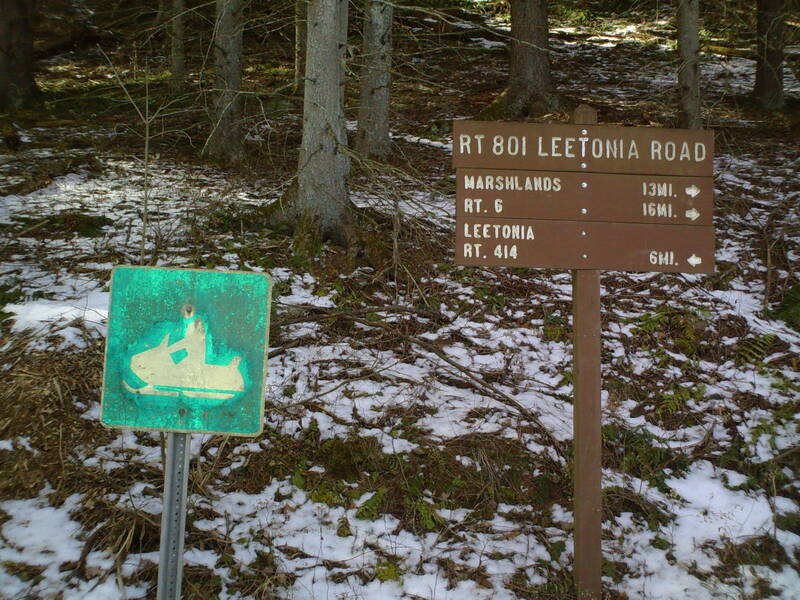 The road is fairly easy to travel with a four-wheel drive vehicle during the times it is below freezing. The base is from 0-3" thick and will soften when the temperature rise making travel a little more slippery. Best to stay in the absolute middle of the road if you attempt the unplowed roads. 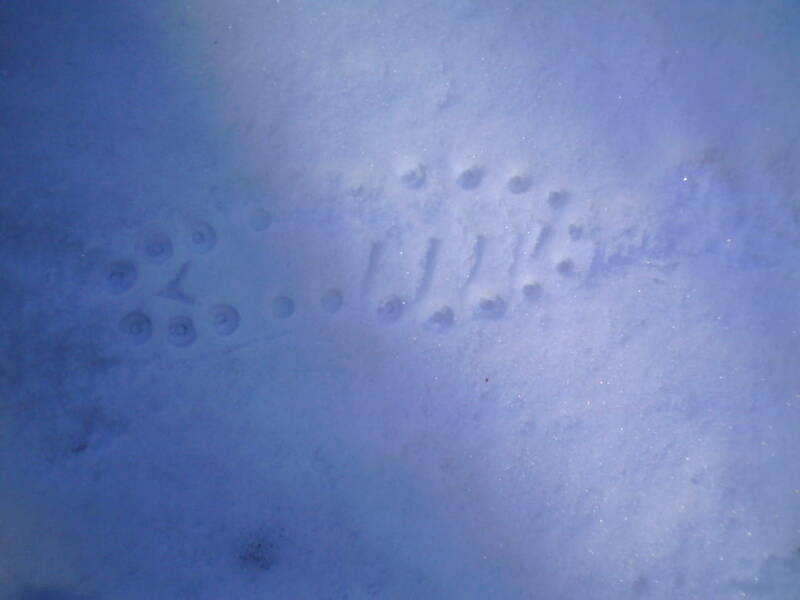 Walking on the roads when they are below freezing gives you a mixture of dirt, ice and snow and is best done with some spikes attached to make walking a little less tentative. Much of the South slopes of the mountain are melted off and during times the sun is out it is quite pleasant to sit in the warmth of the sun. The feral cat is still doing just fine, but still not anxious to be friends. If you get this email via email you will have to go to lostinleetonia.com in order to see the video. You can feel the weather changing from winter to a bit more pleasant weather. I am not ready to call Spring yet, but I think we will have a few Spring-like days soon. Mountain girl, Paula, logging out. 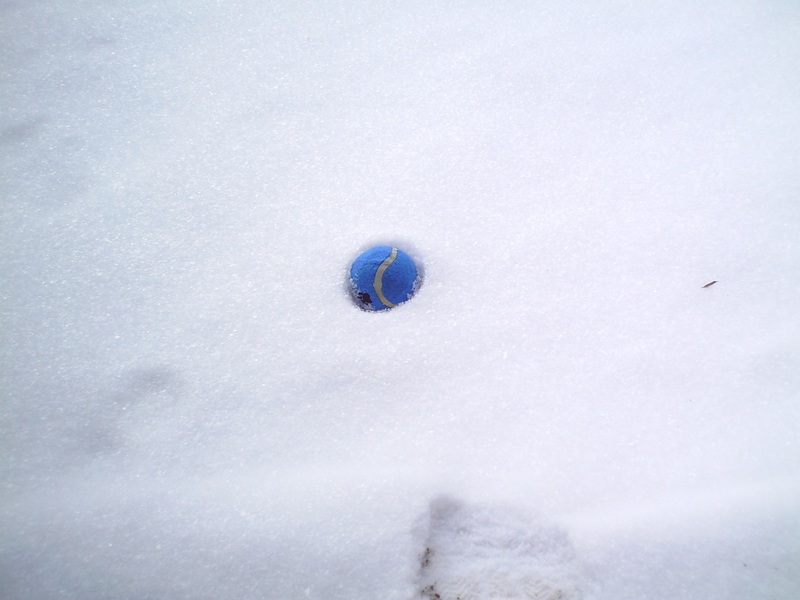 Well, we stayed to the West edge of Nemo and only got about 2 inches of new snow as shown by my tennis ball measurement. 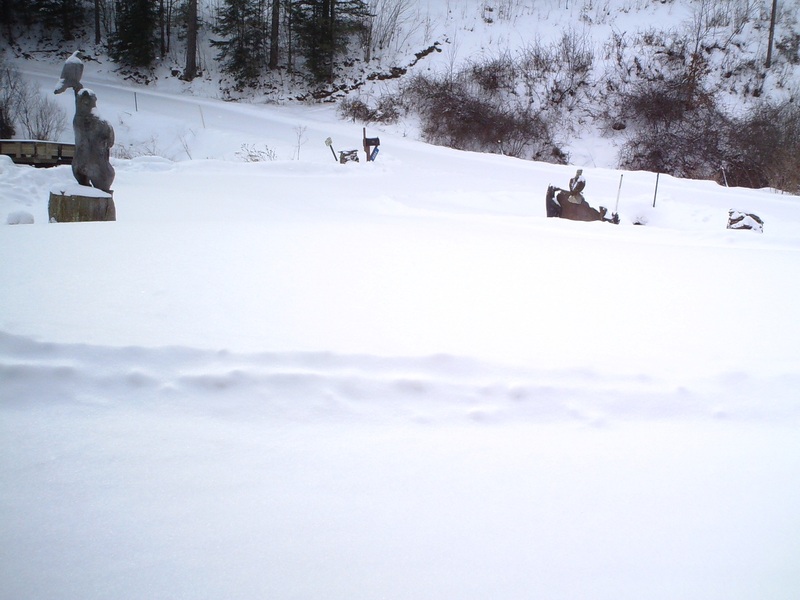 We did get a total of around six inches of new snow over the last week making snowmobiling possible in the upper part of the mountains. I know that down below they didn't get nearly as much so you would need to stay at higher elevation to see snow. We aren't supposed to get any more significant snow and it looks like next week the temperatures are going to be moderate into the upper 30's. The are calling for rain and ice Monday, which is my least favorite. Ice is so difficult to walk on and drive on in the mountains. In fact, yesterday my walk up to the top went fine. But when coming down I was constantly slipping and even fell once. 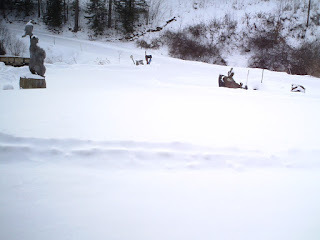 I tried to stay in the deeper snow in the unplowed areas, but that isn't easy either. Usually, by February I am getting tired of winter. Unfortunately, we can never count on getting rid of the snow permanently until the end of April. Since the weather is starting to warm up the Maple producers will be starting to collect sap. 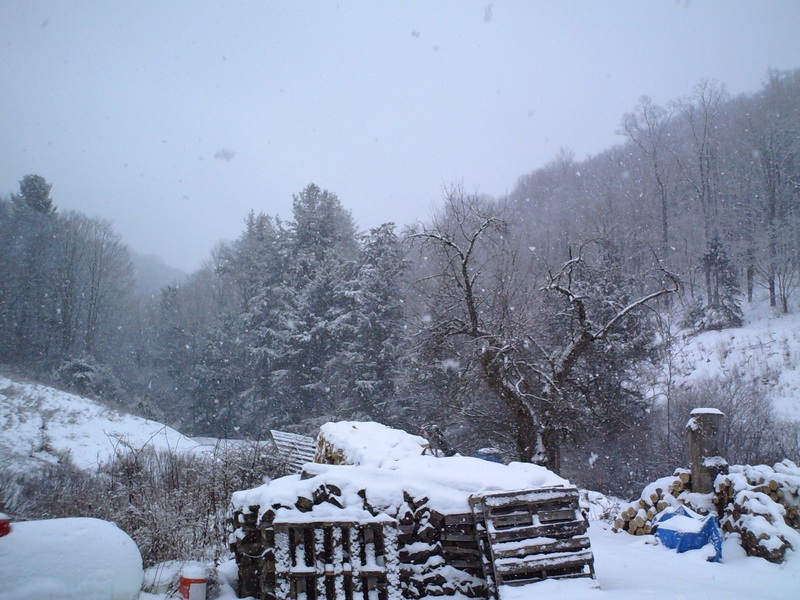 The combination weather needed for sap is: below freezing at night and above freezing during the day. All of our big Maple festivals are in March and are very interesting to see if you have never been. For now we just have to grin and bear the rest of Winter...Spring is just around the corner. Mountain girl, Paula, logging out.